The first time Huang Juan arrived at Sanjia village, in the Guangxi Zhuang autonomous region, her goal was to demolish decrepit buildings and homes, rather than preserve them. She was working on a tourism development program to boost incomes by improving living conditions and rural tourism. Just less than 100 km from Nanning, the region's capital, the village is located in Mashan county surrounded by looming karst mountains. Most of the villagers had moved into their new houses with the help of the government in 2014 when a reconstruction program was launched to promote rural tourism. "How could people make a sustainable future out of a place with little tourism resources like Sanjia," said Huang. "I began to wonder whether there is a way to inspire the villagers to be more involved to attract visitors". South yard is a house she decided to renovate. Its cob brick structure was built more than 60 years ago. 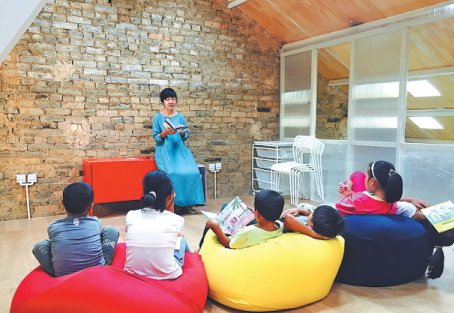 "When there are very few old dwellings left, I began to realize the villagers may lose their past and how urgent it is to save the authentic heart of the place," said Huang. She wanted to restore it as a public space for the villagers and a platform to exchange ideas and introduce resources, or even use it as a place of retreat and contemplation. Mu Wei, an architect who designed the Norwegian pavilion for the Shanghai Expo, joined her and undertook the design. The building was designed in two sections, the former main building and a new light house, which stand together in harmony by the river. The main building, which presents the past, was renovated in its original style with a tilt roof. The light house is characterized with large area of French casement and a wood framework which makes the space transparent and bright. Nearby villagers offered their help in the renovation although they didn't understand her concept at first. South yard was completed in September 2016, after a year's hard work, at a cost of 1.3 million yuan ($190,000). The first time Huang Juan arrived at Sanjia village, her goal was to demolish decrepit buildings and homes, rather than preserve them.